Whether you want to build a new construction, remodeling, or repair the old house, employers must ensure that trade workers in the steel erection field are properly trained and to ensure the safety. Safety in the fabrication and erection steel structure has always been a major problem and a complex operation. Though much improvement in steel construction safety has been achieved, the steel structure fabrication and erection still continues to lag behind most other activities with regard to safety. 1. Designers are obliged to consider whether their schemes can be safely built, used and dismantled. 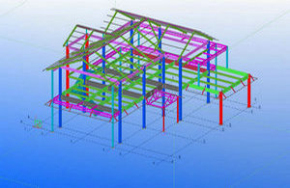 The choice of material for the building frame has a major influence on what is achievable. When handling steel material, appropriate Personal Protective Equipment such as hard hats, steel toed boots, and gloves must be worn. 2. Cranes, forklifts, or hoists used to handle steel must be load-rated for the job. Equipment limits and load charts must be prominently displayed. 4. Rated sufficient for the job. Plate or dog clamps must be used to lift only one piece of steel at a time. 5. Web slings must be appropriately load-rated and must be protected from contact with any sharp edges. Employees using any type of lifting or handling equipment must be competent, and if required, certified in its use. 6. Ensure that the crane or hoist is positioned directly over the load to prevent the load from swinging as it clears the floor or ground. In conclusion, steel should always be handled carefully and slowly in any situation.